These poems are referred to as signature poems because they sum up why I do what I do, and are representative of the philosophies presented in my work. For many years "The Rose And Her Thorns" was my primary flagship poem, particularly when coupled with the photo "Rose After Rain." They can both be found through the P&P index page. 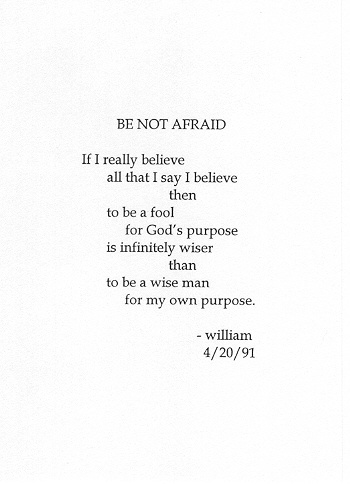 That poem was replaced in 1991 when "Be Not Afraid" became a guiding mantra to live by, while recovering from turbulent times in my life, and facing new challenges in changing circumstances. The others were added later, not only to inspire readers, but to help keep my own perspective on track.